يضمن فندق فندق جريت ساوذيرن بيرث الذي رمم في لزائريه قضاء وقت ممتع في هذه المدينة الخلابة سواء جاؤوا في رحلة عمل أو سياحة. يقع مركز المدينة على بعد فقط. ويمكن الوصول إلى المطار خلال دقيقة. سوف يعشق النزلاء موقع هذا الفندق، فهو قريب من أهم المعالم السياحية في المدينة . استمتع بالخدمات الراقية والضيافة التي لا مثيل لها بهذا الفندق في هذه المدينة رائعة الجمال. يقدم الفندق فرصة للاستمتاع بشريحة واسعة من الخدمات بما فيها: واي فاي مجاني في جميع الغرف, مكتب استقبال 24 ساعة, مرافق مخصصة لذوي الاحتياجات الخاصة, تخزين الأمتعة, موقف سيارات . لقد جهزت هذه الإقامة الفندقية بعناية فائقة لتوفر مستوى عالي من الراحة. في بعض الغرف يجد النزيل مناشف, تلفزيون بشاشة مسطحة, مرآة, بياضات, كاشف دخان. كما أن مجموعة الخدمات الواسعة الموجودة في الفندق لضمان راحتك تترك لك الكثير من الخيارات لقضاء وقتك أثناء فترة إقامتك. إن كنت تتطلع إلى إقامة مريحة وهادئة في المدينة، فستجد في فندق جريت ساوذيرن بيرث بيتك الثاني. يتاح الاتصال بالإنترنت/الواي فاي مقابل رسم إضافي في جميع الغرف. يتبع هذا العقار سياسة صارمة بحظر إقامة الحفلات. إذا كانت هناك أية خروقات لهذه السياسة، سيترتب على ذلك الإخلاء من العقار وفرض رسوم تنظيف. تتوفر مواقف السيارات مقابل رسم إضافي ورهناً بالتوافر. لا يوجد حاجة إلى حجز. يكون حسب سياسة أسبقية الوصول. يلزم دفع مبلغ تأميني بقيمة 100 دولار أسترالي عند تسجيل الوصول؛ وذلك لتغطية التكاليف أو الأضرار التي قد تتكبدها خلال الإقامة، ويُسترد المبلغ عند المغادرة. لا تحتوي الغرف القياسية على نوافذ. In the Chinatown of Perth, although not downtown a free city transit bus is available a 10 minute walk away. This is an older hotel but well maintained.Good size rooms and bathroom, rooms are not serviced everyday which did not concern us. The coffee shop offers reasonable prices meals plus close bye are a number of dining choices and supermarkets. It takes 20 min to Walk to Perth station which is a little too long. The hotel is just outside the free transit zone so u have to walk 7-8 min from where it ends. The biggest disappointment was how dirty it was. Old chewing gum which the cleaning staff had not removed. Old milk in the refrigerators box which made it very smelly. Told the reception about both things. But cleaning staff never came. I left it as a surprise for next guest. I'm sure they still haven't removed it.. Bed was 100% worn out. They need to replace that. If u need a proper grocery market (coles, woolsworth). They are all 20 min walk from hotel.. Too long. I came from the Northern Hemisphere for some sun and light. My room had no window, a very cruel trick, I could have stayed at home for this. Not good sound proofing to the hall, noisy neighbours up till 3AM. Quite a ways up the hill from the centre of town. Very clean, friendly staff but I wouldn't stay here again. A hidden little gem, tucked away in Northbridge but so close to everything. Shops, cafes, restaurants. Perth station is about a 10 mins walk from the hotel which was very convenient for me. Staff were very friendly and welcoming. I booked a room that didn’t include housekeeping which I didn’t mind because I think that most people use too many towels, etc on their stay anyway which they would never do at home. If you do need anything, reception is there to help with more coffee or milk or shampoo or to take your rubbish if needed. I didn’t mind that system at all. WiFi was working well and there is a restaurant and bar in the hotel in case you want breakfast, lunch or dinner. Loved my stay and would certainly consider again. Thank you. I was in room 37, and the bed was way too soft, which in comparison the pillows were too high. I had to use bath towel as my pillow to sleep. Had back pains after two days staying. However, apart from the bed in room 37, everything else was great. Hope the hotel can fix that problem. The place is a little dated, but has nice spacious rooms with fridge, iron and kettle included. Hotel is around 20mins walk away from the city. Ok for a short stay but don’t expect to be right near the attractions and nightlife. no comment for the room and the facility. the location a bit far from the bus station unless you have your own transportation. meet a very bad staff, no patience to serve after we check out. others is just nice. the reception are just the bar counter, the room are upstairs of the bar. the bed are too soft, no heater in the room, only ceiling fan. one of the bathroom, no light, shower area are very small. the location close to fremantle market and fremantle prison. Basic and clean room. Comfortable for 1 or 2 nights. The buffet breakfast had a good variety. Even had fried rice to cater to Asian customers. Worth the spend. Staff during the breakfast service were also very friendly and helpful. We had burgers at the same restaurant in the evening and they were crap and expensive. Had better burgers from Hungry Jacks for half the price. No smile or greeting and the couple looked exhausted and worn out. Then they ate dinner at the table next to us! I think it's unprofessional for staff to eat next to customers and serving your food at the same time. Do not recommend dining there for dinner. It’s not the newest hotels in Perth , but what you get for your money is brilliant . 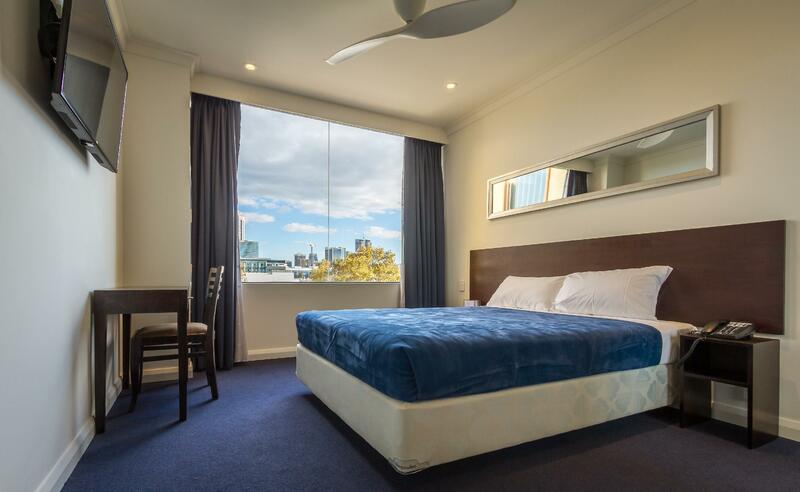 + location ( lots of Asian restaurant within walking distance ) + 10 minute walk to cbd + on-site Parking ( extra fee ) or parking on the street ( free on weekends or between 18.00 - 08.00 ) + Bar / Restaurant with happy hour every day ( 17.30 - 18.00 ) Most the times I booked this hotels I paid around 80 -100 $ per night . Compared to other hotels I stayed in the cbd + the parking stress this is why I review the great southern hotel like this . It’s a good budged Hotel , if you want a bit more luxurious this is not the one . About 1km walking distance from the city centre (malls) but its a pleasant and interesting walk through an unofficial 'chinatown'. The hotel itself is very pleasant, with modern refurbishment, and off street parking is available. Easy access to the hotel as its not in the middle of city business, easy access to freeway to airport. We Loved the 'scenery' attached to the window alcove to hide the effect of a 'wall' outside the window! Plenty of fabulous restuarants close by. The hotel is clean and tidy and situated close to many Asian restaurants, convenience stores and pharmacy (cheap supplements and perfume! ), it took us only 5 mins walk to the Blue CAT bus stop. Our room is clean and tidy with all necessary facilities. We had a wonderful buffet breakfast at the hotel restaurant, various choices and only cost AUD20+ per pax, which was a good deal compared to those cafes in the city. We were satisfied with this hotel in terms of the good rate, location, clean room and also good customer service. The location is located in northbridge, variety of restaurants and pubs within walking distance, there are still a lot of people walking around even after 9pm. There is a restaurant right below the hotel and the room is clean and tidy. 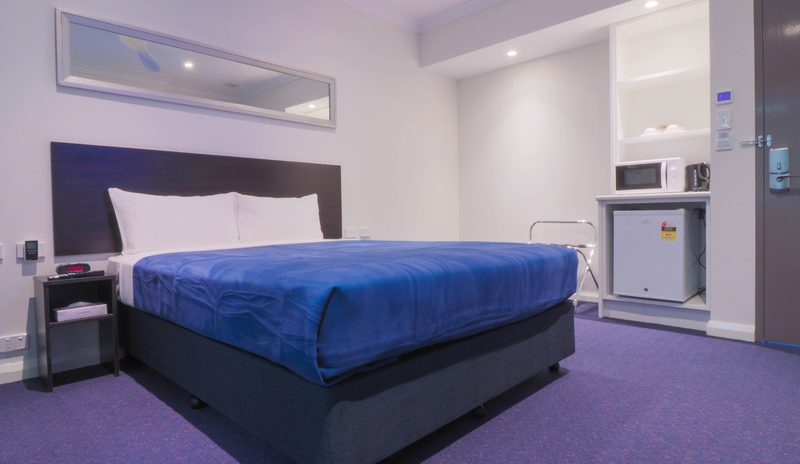 Exactly a value-for-money room with full basic amenities and strategically located at Perth CBD. Clean room and bathroom which comes with bathtub. Only the housekeeping thing needs some improvement. Overall this is a great place to stay that suits small budget. Big room space and good bathroom. Comfort beds. Staffs are friendly and helpful. But no free wifi even in the public area. wifi have to pay for use and very expensive. Parking have to pay $15 per day. And I personal wish can put a microwave in the room.